Washington is home to one of the last and largest Canada lynx (lynx canadensis) populations remaining in the United States. Lynx are among the most endangered felines in North America, with only a few hundred animals suspected to remain in the lower 48 states. In Washington, their range includes the North Cascades—north of Lake Chelan, primarily in the Pasayten Wilderness and Loomis Forest—as well as a few animals in the Kettle River Mountain Range and Selkirk Mountains. As of early 2017, the latest estimates from state and federal biologists indicate there are between 20 and 100 lynx in Washington state. In late 2016, the Washington Department of Fish and Wildlife listed lynx as endangered in our state. In the lower 48 states, lynx are considered threatened under the federal Endangered Species Act. 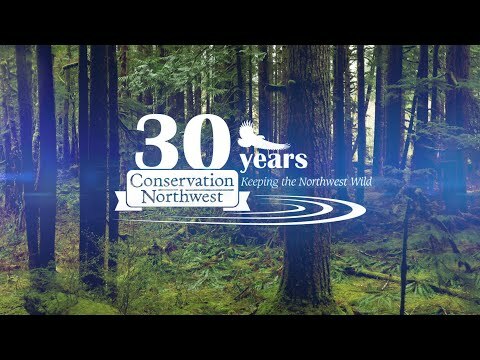 Their protection followed a petition and decade of support by Conservation Northwest and other conservation organizations. Lynx were often trapped for their valuable fur during the last century, and this practice continues in Canada. Today, aggressive logging, road-building and development of lynx habitat has severely fragmented their living space. Snowmobile trails and roads pose problems for lynx because these packed-snow pathways give high-country access to cougar and coyote (which can eat lynx), and bobcat (which compete with lynx). We’ve worked hard to ensure this magnificent animal continues to thrive and recover across the Pacific Northwest. With the help of thousands of Washingtonians, in 1999 we successfully protected the Loomis Forest as the Loomis Natural Resources Conservation Area, saving 25,000 acres of prime lynx habitat. In 2000, with a perilously-low population and a decade after Conservation Northwest filed the original petition urging its protection, the Canada lynx was finally protected under the Endangered Species Act and listed as threatened in Washington. Now, Conservation Northwest is helping protect lynx in Washington in other ways as well, including redirecting logging outside of and connecting critical lynx habitat. Lynx are considered a boreal species. Lynx are specially adapted to the deep snows of northern forests, where their massive paws keep them afloat in their snowy open forest and boreal habitat. Smaller than a cougar but bigger than a bobcat, Canada lynx have silvery fur and black ear tufts. Their tails are shorter than a bobcat’s! Snowshoe hares, the lynx’s preferred food, thrive in the dense cover of a brushy forest understory. Lynx are adapted to the natural fire cycle of lodgepole pines. Fire opens the cones, which release seeds to create supple new shoots that feed snowshoe hares. Lynx need older forests, with plenty of snags, downed logs and woody cover for hunting and denning. Lynx are not particularly fast (it’s hard to hunt on snow! ), so they have to be sneaky and lie in wait for their prey.